Rissi Assani-Alabi is from the Republic of Benin and currently based in Ghana. She works at the African Women’s Development Fund (AWDF) as a Programme Officer for Francophone Africa where she manages the francophone grantees portfolio. She has extensive experiences in grant making, working with nonprofit making organizations, movement building and organizing in French speaking countries in Africa. She is an unapologetic feminist and passionate about women’s rights and leadership issues. She has spent a substantial part of her life promoting women’s rights and social justice. 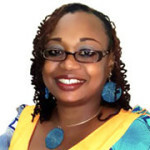 She is also a trainer, a facilitator and professional translator and has used these skills to facilitate the participation of francophone African feminists in many feminist spaces on the continent and to provide technical support for the establishment of a Francophone Women’s Fund in Africa. She holds an Executive Masters of Business Administration from the University of Ghana Business School, a Masters in Public Administration and a Bachelor of Arts in Modern Languages and Translation (French –English –German). She is an alumni of the African Women’s Leadership Institute (AWLI), a leadership programme of Akina Mama Wa Africa (Uganda) aimed at empowering young African women. She is also a member of the Association of Women in Development (AWID).